Several hours left before my Best Friend’s wedding. At this touchy moment, please let me share a bit about the three of us. We met almost 25 years ago in kindergarten and became Best Friends since then. As mentioned before, there are three of us: me -the most annoying one. Oh you can count on me to get into trouble faster than your eyes blink lol-, Retno -the bride to be, our singer wannabe lol-, and Inge -youngest one, but once she pretended to be the oldest, pfffttttt. Lately I had a pretty big problems with Retno, and put Inge in a quite difficult position (I’m sorry!!!). I got mad at her over some problems but I can not say it assertively. Instead I kept it inside and it made me feel bad. Few days ago, I wrote on my facebook status how I feel. Being a bad friend, I had no courage to tell her how I feel. That made me feel bad. And started to blame her, and then started to blame myself, and then started to blame other people. After I vent I feel better, much better. I won’t tell you the details, I don’t wanna bored you to death with this thing. I just wanna say that after I vent I come to realize that I love her so much, that I don’t wanna let anyone ruin our friendship, and that I can’t keep my anger too long. I decided I wanna give her a special wedding gift. Something I make with my own hand. Something to represent our friendship. Based on Celtic knots for friendship and it’s spiritual beliefs about soul bonding and connecting, this design incorporate natural gemstones and wrapped in 999 fine silver. Mo Anam Cara (pronounced: muh ann-imm karrah) is a Gaelic phrase for soul-sister. Celtic spiritual believe that actually soul radiates over physical bodies and it make contact with other souls around. When two (maybe more) souls meet and form deep bond between them, it is said that they have found their Anam Cara. (source). In this design each dents and asymmetric parts are left as it is intentionally, as a reminder that our friendship might encounter troubles and differences, and that it’s not perfect at all. But in the end, I realize that I love her so much that it will top over every problems we have. I really hope she will live a happy marriage, ever after. 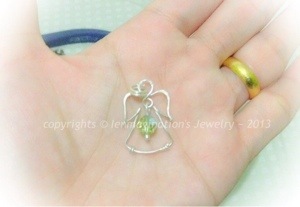 These few past days I’ve been quite busy with my new design: tiny angel pendants. 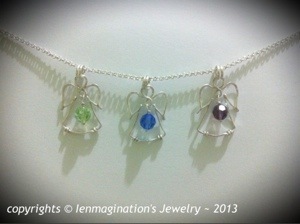 Derived from guardian archangels and birthstone concept, I designed these tiny pendants. Each made of 999 fine silver wire, individually formed and made by me from scratch. And adorned by Swarovski crystal in birthstone colors. While I made these tiny pendants, I imagined everyone who might wear it -a little girl, a teenager, a newly wed, someone’s grandmother, a mother,and so on- and pray for them to be guided by their guardian angel. A little girl I said? Yep! You’re not misread, nor I mistyped it. They are $35.00 each and don’t worry about the shipping cost (because I live far away here), it’s FREE SHIPPING WORLD WIDE. 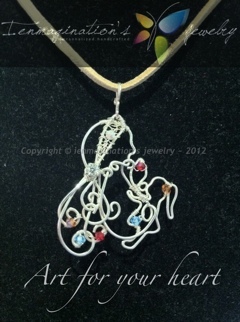 This week featured piece taken from my latest jewelry set project. It was request by my old friend for her wedding day. She came to me few months ago, requested me to design something for her wedding. Her requests were: purple, beautiful, classy, with a bit glamorous touch. When I started to design her jewelries, I was really fond of Swarovski square ring. And really wanna try my hands on it. So I designed a jewelry set using it. Fortunately she approved my design (yeay!). The jewelry making process begun, and I just realized that it’s not as easy as I imagined. To set the square rings was not easy. Specially if I want it move freely like chain. I used jump rings here if you can see the details clearly. When I finally managed to set three square rings as the bracelet focal piece I stucked. Second problem was to make the rest of the bracelet. I wanted it to be delicate. I then decided to make some vines and attached some amethyst Swarovski crystals. I’m very glad that it turned out into sturdy yet delicate part. 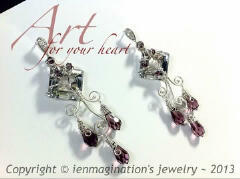 She asked me to make her pierced earrings with chandelier look. Just like the bracelet. Biggest challenge was to set the square rings. With some tricks I finally managed it, and added amethyst Swarovski drop to each swirls. 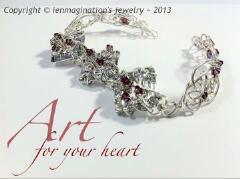 Overall the design was look like intertwined vines with some amethyst splashes. I love how it turns out after I cleaned and polished them using my new flexshaft (YEAY!!! Happy dance). Moreover, I’m really glad that she love them. By the way, this set was made with lots of prayers within each intertwined vines, each swirls and rings and coils..
Prayers for her happy marriage and love life. You can even say it glows..
And no wonder Rudolph becomes one of my fave characters (I love Mickey, and Stitch, and Chip and Dale, and Dumbo, and Bambi, and Goofy too!!). Last Christmas I wanted to try my hands on this reindeer design I have had for several years in my mind. This pendant didn’t take too much time to make. The hardest part was to attach additional wires and make the additional wire invisible. I heated medium sized wires to make balled ends and flattened it with hammer. HO HO HO!!!! Merry Xmas!!! How was your Christmas? Bet it’s wonderful! Anyway, as we celebrate Christmas with happiness, some of us might not. So I just wanna send prayers and positive thoughts to all of them, specially for those who missed their loved ones during this holiday. 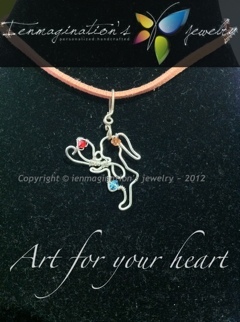 This little guy was made of fine silver wire with balled end. He's pretty small, just 4 centimeters from top to toe lol. Now I'm working on several personalized orders and a new series: Ballerina Series. 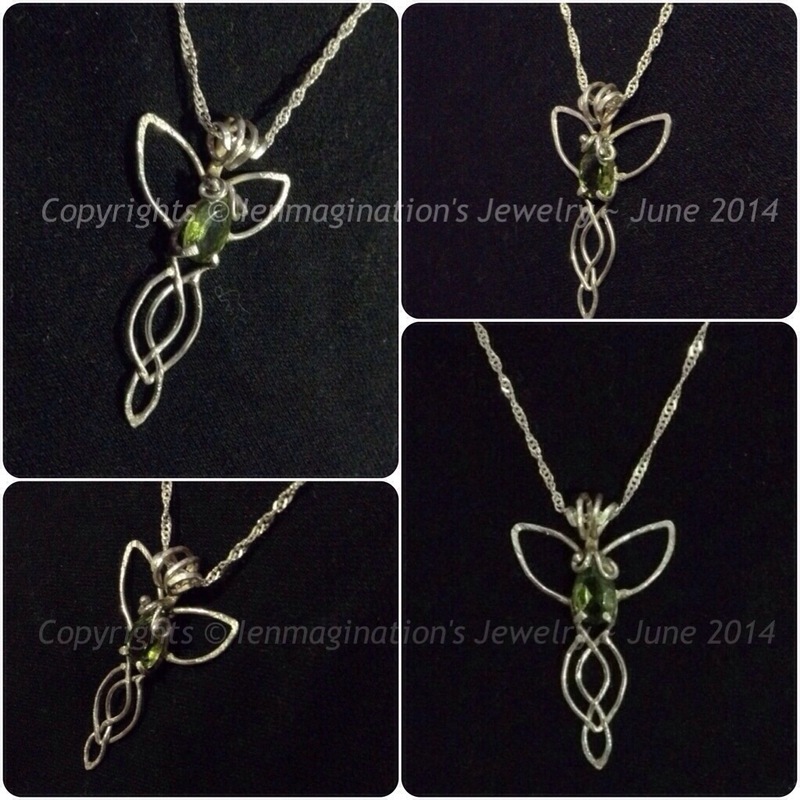 My featured piece for today was taken from my own projects: a puzzle pendant in sterling silver. Actually, I don’t know what do fashionable people call this kinda pendant. But to me, it reminds me of puzzle. So, I call it puzzle pendant. Just like jigsaw puzzle, this these pendants can be worn as single pendant when you pair them together, or wear it separately as independent pendant. 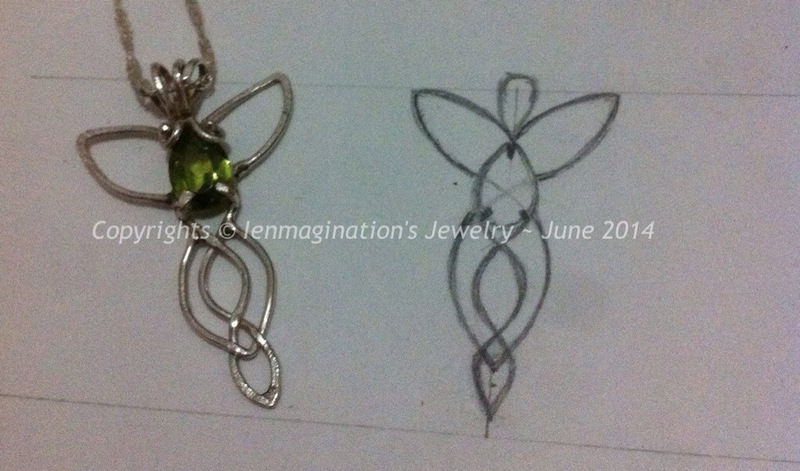 It took me few weeks to figure out how to create the pendant: how to link them without any bail/clasp. Finally I came up with this idea. 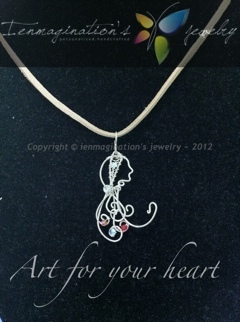 A single piece from mom’s hair and..
Each piece features SWAROSKI birthstone crystals of the family member. In this case: father, mother, and their daughter. Keep your eye on it!! Find what you need here! !